The Data Link Simulator (TL2052) can simulate a wide variety of communications facilities and equipment including T-1, fractional T-1, E-1, fractional E-1, modems, multiplexers,CSU/DSUs, T-1 ESF CSUs, DTUs, NTUs and TIUs. The WAN Tester 1 can test a wide variety of communications facilities and equipment including T-1, fractional T-1, E-1, fractional E-1, modems, multiplexers, CSU/DSUs, T-1 ESF CSUs, DTUs, NTUs and TIUs. 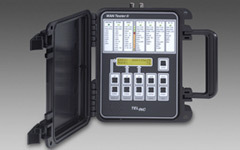 It is supplied complete with V.35, RS232, RS422/RS530, X.21, DS1 (T-1, 1.544 Mbps) and G.703 (E-1, 2.048 Mbps) interfaces. 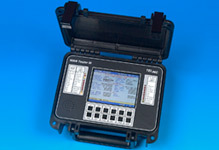 The Telinc WAN Tester II is a sophisticated bit error rate tester in a compact, hand-held package. It can test a wide variety of communications facilities and equipment including DDS, T-1, fractional T-1, E-1,fractional E-1, T-3 and E-3 NTUs,multiplexers, CSU/DSUs, T-1 CSUs, DTUs and TIUs. The Telinc WAN Tester III is a sophisticated bit error rate DS3 tester in a compact, hand held package. The WAN Tester lll can test a wide variety of communications facilities and equipment including T-1, fractional T-1, E-1, fractional E-1, T-3 and E-3 modems, multiplexers, CSU/DSUs, T-1 CSUs, DTUs, NTUs and TIUs. 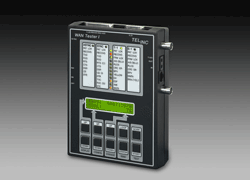 The Telinc WAN Tester IIID is a sophisticated bit error rate tester in a compact, hand held package. It can test a wide variety of communications facilities and equipment including T-1, fractional T-1, E-1, fractional E-1, T-3 and E-3 modems, multiplexers, CSU/DSUs, T-1 CSUs, DDS CSUs, DDS CSU/DSUs, DTUs, NTUs and TIUs.